Last night I sat in a small support group of teenage mothers, and one brave young woman, Liz, walked to the front of the room. Less than four months ago Liz showed up at our group with a dump truck of sin weighing down her heart. She was so ashamed of her recent mistakes that she’d missed many meetings. Yet a glimmer of hope stirred inside. Go to them, and ask for prayer; maybe they’ll still love you. The first night back, Liz took me aside, and we found a quiet room. She poured out her heart, and I cried along with her. Then she prayed and accepted Christ in her heart. As I led her in that prayer I could feel the weights lifting: pain, shame, disgrace . . . they were boulders being hurled from her back. We stood and embraced, and the light on her face reflected the transformation in her heart. She prayed and asked God to take over, and He did. Man, how He did! “You’ll never believe all God’s done for me. He’s provided people to care for me, to mentor me, and He’s taken care of all my needs and the needs of my two kids.” Liz walked away from unhealthy relationships and discovered a community of Christians to care. She’s a different mom, a different student, a different friend. And as I sat and listened with tears in my eyes, I realized that every moment I’ve spent volunteering in these teen mom support groups was worth it. It was worth it because Liz is worth it . . . and so is every other young mom who needs to hear the truth of Jesus’ love. I’ve been honored to watch these stories of transformation unfold, but that’s only happened because deep down I knew there was someone out there who needed to hear. There is someone in your community who needs to hear, too. Someone who feels alone. Someone who feels unworthy. Someone who feels ashamed. Somebody needs to hear . . . they are worth your time. Somebody needs to hear . . . that God’s grace is for them. Somebody needs to hear . . . that their darkest sins are not too dark for God’s light. Somebody needs to hear . . . there is hope. Somebody needs to hear . . . peace can come. Somebody needs to hear . . . about a second chance through Jesus. Do you want to meet for coffee? Do you want to hear how I’ve messed up? Do you want to hear what God did? People need to hear about Jesus, and it’s hard to take the time, energy, and even money to make that a priority. As I leave home and drive to our Thursday night meetings, I’m lucky if I’ve slapped together peanut butter and jelly for my husband and kids. I’ve stepped out of movies to take desperate phone calls. I’ve bought food, diapers, and door prizes to draw in the young women who need help, and I’ve asked myself, “Will they ever understand?” when it seems like they won’t. But I continue because I know that someone needs to hear . . . and if I don’t tell them who will? I also remember being the one who needed to hear about Jesus’ love and forgiveness when I was a soon-to-be mom at age 17. Somebody talked to me, and it cost them, too. Was it worth the cost? Was I worth the cost? I feel it was. I feel I am. “Take up your cross and follow me,” Jesus said, and in 2015 that looks a little different than what it did in Jesus’ day. It might mean asking a friend to drive your child to t-ball practice, or walking away from that pile of dishes, or spending hard-earned cash to hire a babysitter for two hours so you can take someone out to just talk. Sacrifice is sacrifice, big or small. But transformation is TRANSFORMATION in the lives Jesus touches through you. Without us stepping out and doing our part, who’s going to tell them? Who’s going to tell her? And without being told how, will they know Who to follow? And if they don’t know Who do follow, where will they wander? Into sin, pain, darkness, shame and regret. It’s easier to shake our head at their choices than to reach out an be a friend. Because it costs us something, doesn’t it? Will you do it? Will you speak? Will you give? Will you love? Do you know a Teen Mom? You can pre-order my new book, Teen Mom: You are Stronger Than You Think. Read the original post at forthefamily.com. Powerful article, Tricia! Can’t wait to read your book! Tricia, your post is inspiring! I have recently started a ministry to show the love of Christ to teen moms. Just as doubt starts creeping in God places your post in my sight! Thanks for your willingness to write and share. Keep it up, Christy! It’s a hard ministry but SO worthwhile! 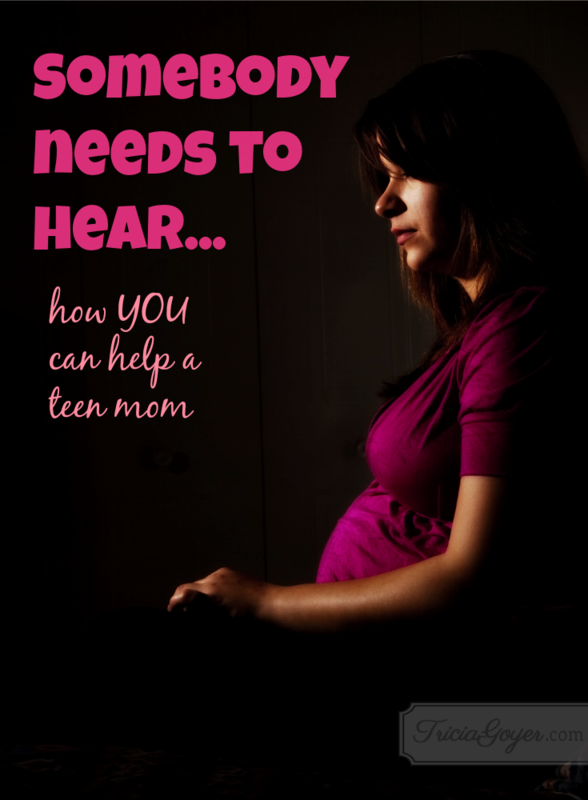 Also, fill out the form here: http://www.triciagoyer.com/share-teen-mom-someone-today/ to get a free copy of my book!